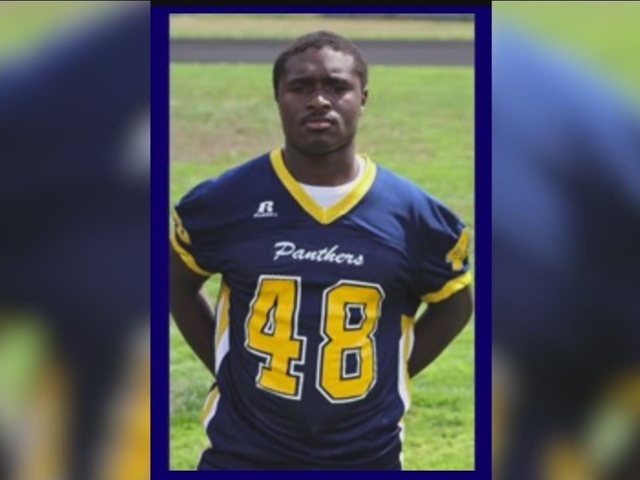 A Euclid High School football player died Sunday, following injuries from a Friday night football game. Euclid High School junior, Andre Jackson, died Sunday after he sustained an injury during the school's game against Solon High School. He was a full back and an outside linebacker for the team. His cause of death is still unknown. Euclid High School head football coach Jeff Rotsky said the incident happened during a "completely normal" special teams play. "It was a pooch kick," he said. "He was going for the ball, and their guys were going for the ball, and I think he got kicked or kneed." The school district said Jackson walked off the field after the play, went to the hospital and was later released. Today, Euclid High School junior Andre L. Jackson passed away following an injury sustained during Friday night's football game. Andre was a hardworking student-athlete that brought smiles to all those with whom he came in contact. The Euclid City School District would like to extend its deepest sympathy to the Jackson family during this horrific time. The Solon Schools are mourning the loss tonight of Euclid High School student Andre L. Jackson, who passed away earlier today. A junior and member of the Panthers football team, Andre was 17. He sustained an injury in Friday night's game against the Comets. The cause of his death is yet unknown. Everyone in the Solon Comets athletic program and the Solon Schools sends prayers and thoughts of comfort to Andre's family, friends, teammates, coaches as well as the Euclid High School and Euclid communities. Counselors will be available this week for our Solon students who want to talk or need additional support. It was Jackson's bright smile and constant kindness that Rotsky continually referenced Sunday night following the 17-year-old's death. Prayers go out to Euclid football as they mourn the loss of their fellow teammate #48 Andre Jackson. #RIPandre ?????? Euclid High School is supposed to host its homecoming game Friday night but officials said they are unsure whether the game will still be played. School will be in session on Monday with grief counselors on hand.